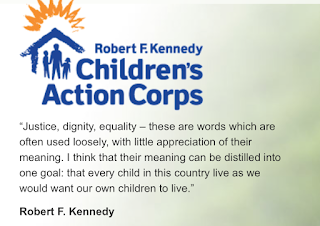 I am very proud to be an Advisory Council member and long-time supporter of Robert F. Kennedy Children’s Action Corp. This is an organization that does so much to help Chldren in crisis. 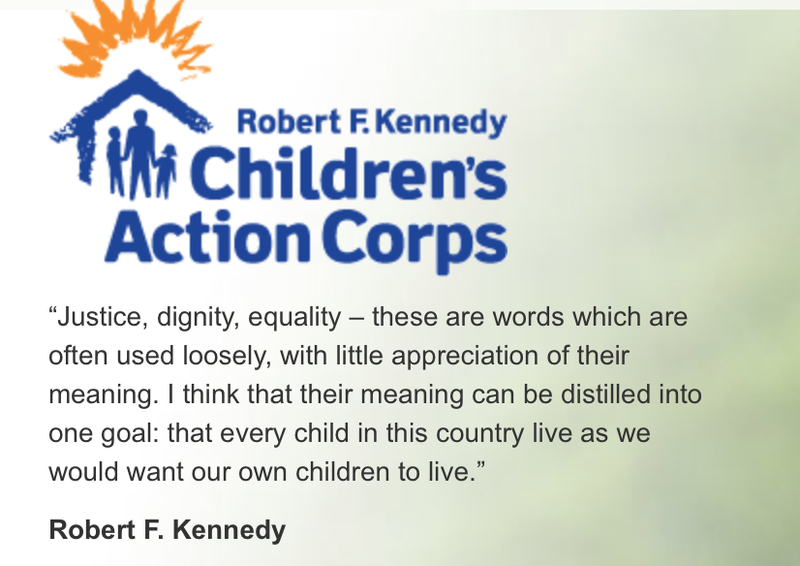 For over 40 years, RFK Children's Action Corps has been a leader in child welfare and juvenile justice, operating a number of programs and services for at-risk youth and families, providing a safe haven for children who come to their door with nothing.Their work includes community based initiatives, residential treatment and juvenile justice programs, partnering with national organizations and state agencies to use proven methods and develop new ways to advance practices in the care of those most vulnerable. They help individuals and families overcome difficult challenges and situations by providing the tools and skills they need to heal, grow, and thrive. Everything they do is based on the belief that every child deserves the chance for a brighter tomorrow. PLEASE WATCH & READ THE FOLLOWING MEDIA COVERAGE TO SEE WHY I AM AN RFK CHILDREN'S ACTION CORPS ADVISORY COUNCIL MEMBER. HERE I TALK ABOUT MY MOTIVATION FOR BEING INVOLVED, & WHAT MY TIME SPENT WITH THE YOUTH AND STAFF MEANS TO ME. October, 2011 - Charles Shaughnessy, RFK Children's Action Corps Advisory Council Member, visited the Lancaster Campus and held a workshop on acting and improvising for the boys and girls in our programs. As you hear from Charles and one of our staff members the workshop is so much more than just an acting class. RFK Children's Action Corps, Advisory Council member Charlie Shaughnessy visited the Fay A. Rotenberg School on October 13, 2012. The Fay A. Rotenberg School provides education, therapy and counseling to girls who have suffered from significant traumatic incidents, including sexual and physical abuse, poverty and homelessness, sexual exploitation and/or a family history of violence, child abuse or involvement with the justice system. RFK Children's Action Corps Advisory Council Member Charlie Shaughnessy talks about the importance of therapeutic arts particularly in residential based services. RFK Children's Action Corps Advisory Council Member, Charlie Shaughnessy, talks about his motivation for being involved and what his time spent with the youth and staff means to him. October, 2011 - Charles Shaughnessy, RFK Children's Action Corps Advisory Council Member, visited our Lancaster Campus and held a workshop on acting and improvising for the boys and girls in our programs. As you hear from Charles and one of our staff members the workshop is so much more than just an acting class. "There was no gray. I was either silly or angry. The thing that helps is for somebody to listen to us, and make us believe that they want to listen to us." LANCASTER — For one shining October afternoon, the basement gym became a theater workshop, the basketball hardwood floor became a stage for 20 kids and their mentor and guide, Charles Shaughnessy, stage and television star. The British actor who recently played King Arthur in Monty Python’s “Spamalot” at the Ogunquit Playhouse in Maine, and also starred in the CBS show, “The Nanny,” the daytime series “Days of Our Lives” and the Emmy award winning AMC production of “Mad Men,” volunteered to conduct a private theater workshop for children at the Robert F. Kennedy Children’s Action Corps Lancaster campus yesterday. The young people, ages 7 to 18, have experienced abuse or neglect and were not the easiest audience to engage. Mr. Shaughnessy led the kids through warming up and focusing exercises, and within the hour had them laughing, smiling and following his lead. “It’s amazing to me that he has got them to be kids, being goofy and silly; they don’t put themselves out there in front of each other like this,” said Residential Director Phil P. Pichie. Ulises Robledo is a graduate of the Lancaster RFK Action Corps and made a special trip to be a part of Mr. Shaughnessy’s workshop. But it was not easy. When he entered the RFK program, he was only 14, very angry, and could not read or write. “I used to punch walls because I did not think I was loved. I saw kids with their families and used to cry myself to sleep, because I didn’t know the ‘middle,’ I only knew black and white, there was no gray. I was either silly or angry. The thing that helps is for somebody to listen to us, and make us believe that they want to listen to us,” Ulises said. Mr. Shaughnessy created the workshop program using basic improv exercises. “It’s about getting out of the way of yourself; getting the kids to see that they can do this and still be in touch,” he said. The program was not what she expected. “Doors opened for me, I built relationships (with the staff); I got a job! Talking about things, keeping in a good space, things are much better now,” she said. The theater workshop was another new experience; one she enjoyed. “It’s all about taking chances and trying to do something different. The old me, I wouldn’t have done this, I would have said, that’s stupid. Now I know that there is another side. You can’t beat it until you try it,” Keisha said.